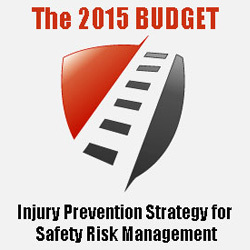 As we begin to budget for strategic objectives in 2015, several work safety topics centered around an important theme come to light. Posts ranging from safety training to workers comp/EMR risk, the importance of conducting fall hazard assessments and engineering fall prevention design — each capture elements of what I believe to be the annual theme for our blog, and what may be the most notable national work safety theme of 2014: Preventive Safety Risk Management Strategy. Comprehending and preparing for the preventive work safety trend will prepare you for 2015 budgeting and set your organization on the path towards a beneficial work safety culture. While this may sound complicated, strategy setting will become easier after considering the benefits of preventive safety strategy. The concept of pursuing Injury Prevention tactics for Safety Risk Management is not a revolutionary approach, nor is it a simple strategy to follow. The motivation behind injury prevention strategies that minimize risk to reap long term safety benefit is based in the complementary advantages provided by a preventative safety culture. Risk prevention strategy involves foresight and planning, and requires a greater upfront investment cost. Over time it will result in fewer injuries, worker lost time reductions, improved workers comp rates, and other indirect savings and benefits. From this perspective, preventative safety risk management ultimately provides inherent value to businesses that are financially stable and well-managed. These businesses are typically set up to plan ahead strategically and invest accordingly. If they are able to effectively implement safety risk management strategy, they will thrive when compared to protection-focused strategies with stringent safety controls. The elements of successful injury prevention strategies are not unlike those of a typical work safety program, with respect to procedural elements. Hazard assessments, incident recording, policies and training remain standard work safety objectives. The subtle difference between injury prevention through safety risk management versus protection and control strategies is that prevention policies and controls are engineered to prevent risk, as opposed to simply identifying risk areas and protecting workers. For example, while injury risk hazard assessments are an element of most work safety programs, an overarching preventive strategy will interject that step into the initial processes of any new development or work activity. The goal is circumventing, not simply mitigating, potential risk areas. With this in mind, preventive strategy is most effective when work safety culture is established and new initiatives are supported by an acknowledged organizational safety commitment. In support of building a work safety culture that values and supports injury prevention ahead of protective measures, safety incentives should be structured to reward preventative innovation as opposed to strict adherence to performance metrics such as injury rates or lost time. For example, an organization might hold a contest that challenges employees to propose an injury risk prevention strategy that reduces injury risk for the work process that had the highest injury rate the previous year. This approach delivers the strategic preventative message while working to solve a problem, and also helps to increase employee commitment through involvement. Similarly, training documentation should emphasize the importance of avoiding unnecessary risks as much as utilizing the proper protective equipment or following the recommended procedure. In an injury prevention safety environment, the goal should be to efficiently avoid risks, not plow through them with precautionary measures. At Safety & Numbers we are building customer interest in The Trucker Series trailer access products, in the form of real genuine online product reviews at IAScustom.com. You know… like the ones you see on Amazon, only better. We think IAS produces the highest quality and safest trailer ladders available and we’d like you to help us make the web just a little bit more accurate on that topic. In fact, our newsletter is offering a promotion for those who provide an Online Product Review at IAScustom.com. And yes indeed, we want to pass along that promotional opportunity to you faithful readers as well. Simply provide an email address with your Online Product Review and/or Sign Up for Our Newsletter so we can send along the promotional code. Thanks in advance! In a day and age when impressions are gathered in 140 characters and time is managed down to the minute, versatility and convenience are especially valuable. That’s why many of our customers choose The Trucker® Series. Our ladders are easy and safe for any truck driver or style. The shining example we have mentioned before. The Trucker is the Safety Best Practice at United Rentals. With over 800 locations, that is no small feat. Still, we’re proud to serve companies across the country and in dozens of industries. We want you to know that this isn’t just brash talk. The Trucker Series ladders have exceeded even our own expectations as we have grown over the years. IAS produces access ladders for a wide variety of customers across the country. IAS products are safe, durable and convenient for applications ranging from contractor work safety to boat boarding at the lake. This versatility has earned raves from safety minded contractors and mobility challenged individuals alike. Here are two examples of testimonials for work safety and optimal accessibility. Trucker® ladders are designed for simple and safe access to any truck trailer. This safety manager at a Fortune 500 construction contractor and long time IAS customer has great things to say about Trucker® trailer access ladders. I have utilized your products on jobs I have worked on for the past 4 years, once we started using your Trucker and Drop Deck ladders we realized the great benefits and quality the IAS products provided. Since using your products our yard bosses and operators have asked for them by name. Any time I show up on a new job, your ladders are one of my first purchases. Our truck loading and unloading procedures now call for your ladders specifically, they are in such high demand they have to be assigned to crews and locked in the storage box at the end of each shift. I couldn’t ask for a better product as far as safety, quality and ease of use. The Tooner I Ladder is designed for safe and convenient access to pontoon boats. This customer was especially grateful for the accessibility and safety of the stairway ladder design with a rope available to assist with ascending up and out of the water. I hope that you had a wonderful and safe holiday weekend. Just so you know, we are very impressed with the ladder and it’s quality. I had a skydiving accident 5 years ago, and injured my spinal cord. I have limited mobility, and this ladder now allows me to go into the water and enjoy the lake with everyone else. Seems like a small thing, but it’s HUGE to me. Attenuator trucks are highway safety vehicles equipped with an impact attenuating crash cushion for the purpose of reducing the risks resulting from crashes in construction work zones. These specialized vehicles are often required for government highway contracts to improve safety and reduce work zone fatalities. The truck mounted attenuator, or TMA, is a crash cushion that is specifically designed to attach to a vehicle such as a snow plow, road construction vehicle or maintenance truck, in order to absorb kinetic energy if struck by a motorist. Not only do attenuator trucks save lives by absorbing the impact of a crash, they also reduce debris hazards after impact to improve traffic flow and reduce the risk to passing motorists. TMAs are tested by the federal highway association for effectiveness and speed ratings. When mounted to road construction vehicles, TMA attenuators are subject to weight requirements and must be positioned at adequate distance to ensure the safety of workers and equipment in the event of a crash. There are various types of truck mounted attenuators including tiltable or foldable options and trailer mounted attenuators. Tiltable options such as Trinity Industries’ MPS-350 are designed so that the attenuator will pivot up or down to engage or disengage the attenuating crash cushion. Foldable options such as the Safe Stop 180 will fold in half so that the attenuator is stacked on itself when disengaged. Trailer mounted varieties do not pivot or tilt and are always engaged when attached to a truck. Road construction attenuator trucks typically have a bed for transporting equipment and an arrowboard or message board to instruct drivers of traffic conditions. Many other equipment options may be necessitated by the environment and conditions including strobe lighting for driver awareness, work lights for night visibility, and equipment racks. 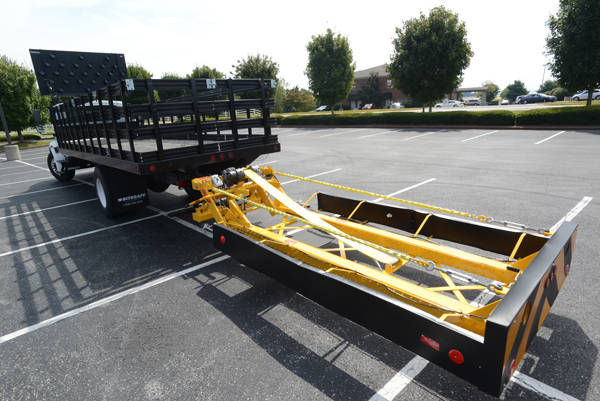 Review a summary of attenuator truck options and equipment. Safety & Numbers blog sponsor Innovative Access Solutions, LLC produces portable flatbed truck access platforms for fall protection safety. The IAS platform is a new and innovative approach compared to other available flatbed fall protection options. With this in mind we are happy to help promote and review the advantages of a lightweight, portable platform as compared to bulky traditional wheeled systems. 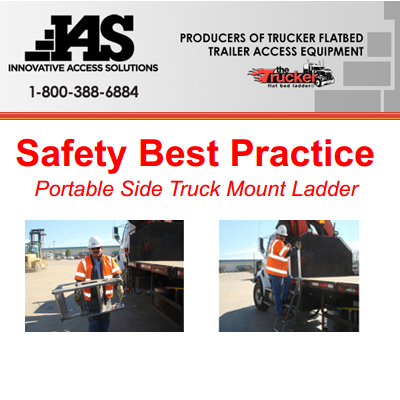 As mentioned above, the IAS flatbed access platform is an innovative approach to fall protection for loading/unloading, tarping, and maneuvering around flatbed trailers. The platform is composed of lightweight aluminum and equipped with CNC billet mounting hooks, making it ideal for fall protection at offsite locations, on stationary trailers, and where space is limited or time is of the essence. The IAS flatbed access platform is ANSI rated to 3 man / 3,000 lbs making it versatile and durable. IAS platforms also provide a safety rail that is easily removable for convenient stow away and mobility. The IAS flatbed access platform is standard at lengths of 4′ and 8′ and can be customized to meet specialized requirements. The majority of available flatbed access platform systems are wheeled or rolling platforms. These systems are ideal in certain applications. Truck fleets with high shipping volume, available space at their facility, and a sizable work force will appreciate the traditional wheeled flatbed access platform system. These systems typically provide space for a truck trailer to pull in between two parallel platforms which sandwich together on each side of the trailer deck. Traditional systems are generally expensive and less flexible. When deciding on the best fall protection flatbed access platform for your company’s needs, we recommend considering available capital/workforce, the importance of mobility, and whether a bulky wheeled system will suit your needs. The IAS flatbed access platform is mobile and portable, preventing the need to have a system consuming space at each site. Being lightweight and modular, it is also easier to mount at any location and with fewer available workers. 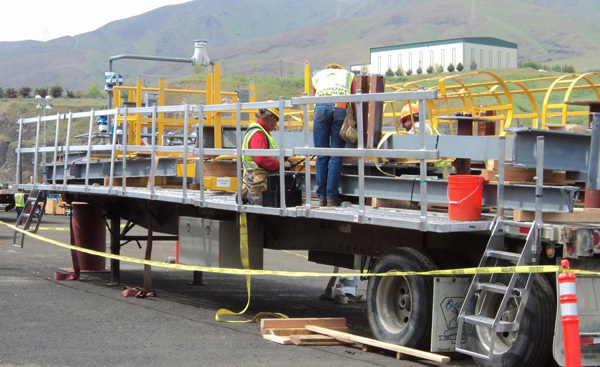 And the IAS flatbed access platform is ideal for specialized applications such as stationary flatbed trailers, contractor truck fleets, and industries including construction, mining and energy. Whichever flatbed access platform you choose, always remember the importance of fall protection risk management even at limited heights. Investing in basic fall protection safety equipment such as a flatbed trailer work platform will ultimately save money and hardship in the long run when compared to workers comp claims, lost worker time, and indirect work injury costs.